Questions? Chances are someone else might have asked them before you. Click on the small +'s below and see how wise you can get. If you can't find what you're looking for, don't hesitate to drop us an email. We'll be happy to help! Both our houses are located just south of the city centre, appr 5-15 minute walk. Bus no 34 passes by, but it's actually easier to walk as it's just 3 stops away from the centre. See the respective 'location' pages in the menu to the left for more info. There are grocery stores located within 200-300 meters from each of the houses, and they're open until 23 / 11 pm. Do ask for directions when you check in and we'll give you all the details. The finish line is at the main square in the center of town, from which there is a distance of 1,2 km to Strandvegen 45 (the Writer's home) or 1,5 km to Strandvegen 84. Perfect for a slow cool-down on the way to a nice and well-deserved shower! No meals are included, but you are given access to a fully equipped kitchen in which you can prepare your own meals. All rooms has it’s own shelf in the fridge, as well as storing space for dry foods. Yes, most certainly. You are welcome to store your luggage under our stairs in the hall downstairs (in both our houses). In this case you will be given an extra key for the front door - please ask us about this when you check in and we will explain how it works. The fisherman's house has a private parking lot 50 meters from the house. There is only one space, so let us know when you book the room if you need it. The writer's home has parking spaces along the road. There are 1-2 available parking spaces just outside the house. Let us know if you need parking when you book the room. The parking spaces are reserved on a first-to-order, first-to-get-it-basis, so if you don't reserve it when you make the booking or if someone else has already booked it before you did, we cannot help you. We don’t offer any rental services, but Tromsø Natur & Fritid offers ski, bike and clothes rental. Generally: If you plan to bring along a sleeping bag, your own bed linens (sheets, covers etc.) or similar you won't need linens. If you don't plan to bring anything along, you do need them. You are not allowed to sleep in our beds without any covers, linens or similar due to our hygienic routines. The fee of 50,- per person is a one-time fee to cover our expenses. By separating this cost from the room itself it is possible for those who want to keep the price as low as possible to save this money by bringing their own, thus helping us saving our expenses. You don't need to arrange with pillows and blankets yourselves. Just show us your linens when you check-in and we will provide you with what you need. The fee of NOK 50 includes both linens and towels and is not put together by two individual fees. Therefore it's not possible to separate the charges and pay for only one of them, sorry. We might change this in the future, but at this point it will simply complicate our life too much to offer such an option. You can wait until you arrive to tell us if you need linens or not, but then you'd have to wait for us to prepare the room while you are there, if you want the linens. If you tell us beforehand it is easier for us to know how to prepare the room for you. Check-in is flexible and check-out is no later than 11 am, unless anything else is agreed. PLEASE NOTE that we do not have any reception however, so we appreciate it a lot if you can tell us beforehand when you will be arriving so we can make sure we are there to welcome you. If you arrive after 16.00 / 4 pm on weekdays or after 13.00 / 1 pm on a weekend, your key will be located in a special key box by the door. You will need a code to open it - this and all needed instructions on how to get in and important things to know about the house will be sent to you by email before you arrive. So the only thing you have to do is tell us that you will arrive late and we will make sure you get everything you need. Then we will meet you in the house next morning to greet you, arrange the payment and answer any questions you may have. Please let us know what time is good for you so we don't wake you up or are out running errands elsewhere while you are waiting for us in the morning. We are around every day from 9-16 on weekdays and 9-13 on the weekends, and you are welcome to come and check in any time those hours. Please note however that we can't promise to have your room ready before around 14 (2 pm). Check-out is at 11 and then we need some time to clean the rooms. But you are more than welcome to come to the house before this to meet us, do the payment, drop off your luggage and get your keys. Please also note that we have no reception in any of our houses, and that it therefore is necessary to make an appointment in order to get checked in. We have two houses and are running between them, so it's nice if you tell us when you want to come so we can make sure that we are there to welcome you. We ask that you make such an appointment as soon as possible after your booking, and at the latest 24 hours prior to your arrival. Great! We do offer fishing trips with our small boat Inna, mainly in the summer. There are no regular tours but you agree on a time with the captain directly. Please see our fishing trip page for all the details! For northern light tours, we recommend Northern Shots. You can buy a ticket directly from us - please ask when you book or check in and we'll arrange everything (Sept-March). For wildlife experiences such as dog sledding, snow shoeing etc. we recommend Tromsø Wildlife centre. For delightful experiences at sea we offer fishing trips and whale watching tours with our small boat Inna. 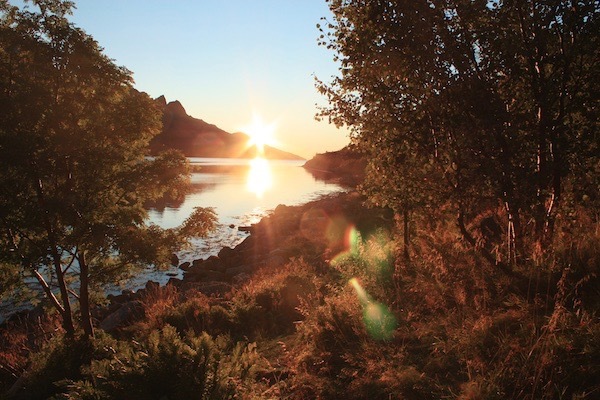 For other excursions or tips, we recommend you to ask the tourist information office: Visit Tromsø. Please see our whale safari page for all the details! Yes! It is possible to see the auroras from the house, but of course the conditions are better the farther away from the city lights you get. It's a bit like the stars - you can see them wherever there's a clear, dark sky above your head, but the less light you have around you on the ground, the more you'll see of them. The sun has to do its thing, i.e. making explosions and eruptions happen and blow solar wind our way through the solar system. The amount of northern lights on display in our sky is completely up to the sun. The sky has to be clear, so that the clouds don't stay in the way for the show. This obviously means that you have to have a bit of luck to experience it, but fortunately the chances are quite good - and of course, the longer you stay, the better the chances.